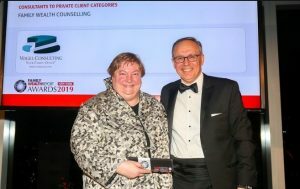 Vogel consulting, an independent multifamily office, was the recipient of the ‘Best Family Wealth Counselling’ award at the 6th Family Wealth Report Awards 2019. The glittering awards dinner was held at the exclusive Mandarin Oriental, New York. One of six firms to be shortlisted in the Family Wealth Counselling category, the achievement is yet another milestone in the Company’s drive to be recognized as one of the premiere players in the competitive multifamily office space. Commenting on the firm’s win, Rhona E. Vogel, Founder & CEO, said: “We are delighted to have been voted the winner of this prestigious award. The judging panel reads as a ‘who’s who’ of the industry and I am honored to call them my peers”. ClearView Financial Media’s CEO, and Publisher of Family Wealth Report, Stephen Harris, was first to extend his congratulations to all the winners. He said: “The firms who triumphed in these awards are all worthy winners, and I would like to extend my heartiest congratulations. These awards were judged solely on the basis of entrants’ submissions and their response to a number of specific questions, which had to be answered focusing on the client experience, not quantitative performance metrics. That is a unique, and I believe, compelling feature. These awards recognize the very best operators in the private client industry, with ‘independence’, ‘integrity’ and ‘genuine insight’ the watchwords of the judging process – such that the awards truly reflect excellence in wealth management.